The Class of 2019 Application Period is now closed. 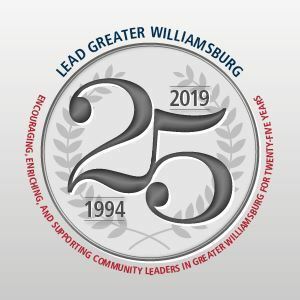 Participation in LEAD Greater Williamsburg requires a serious commitment of time and energy. A welcome reception, class orientation, and an overnight two-day retreat, to learn more about the program’s objectives, community issues, and to develop team spirit and camaraderie. Some preparation prior to selected sessions. A class project that will require at least 40-60 additional hours, outside regular class time. A final-day evaluation and graduation. Optional social events may be scheduled throughout the year. Class size is limited to 25-35 participants. Selection is made by a Chamber of Commerce-appointed committee that considers candidates who represent a cross-section of community sectors: business, education, the arts, religion, government, community-based organizations, and ethnic and minority groups that reflect the diversity of the community. Each candidate must have a demonstrated or clearly expressed interest in community service. Each candidate and his or her employer or sponsor must pledge to the time commitment. Applicants who are not accepted for a particular class may reapply. The enrollment fee for the Class of 2019 is $1,200 for Chamber members and $1,500 for non-Alliance members. This covers all sessions, meals, and the retreat. A limited number of partial scholarships, tuition assistance, and/or payment plans may be available for participants from small business, non-profit organizations, or self-sponsored individuals. The application period for the Class of 2019 is now closed. Classes are held every other year. Applications for the next class will be available online or from the Chamber office beginning January 2020.